Surprise your loved ones by sending this Smarty Dashing Love Tower and make them happy. 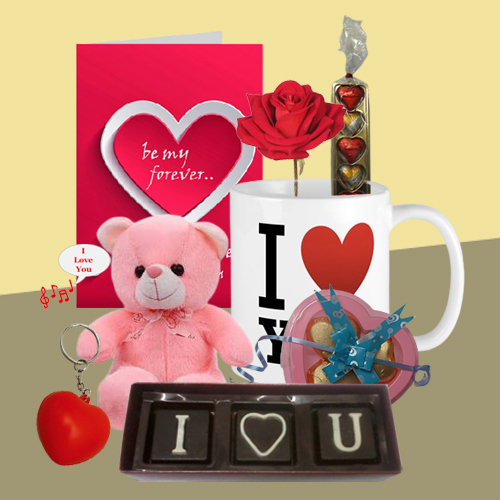 This Combo of exclusive gifts is arranged with 5 Pcs Homemade Golden Heart Chocolates, an "I Love You" Card, a Singing Teddy, I Love You Handmade Chocolates, 3 Pcs Heart Shaped Chocolates, a Velvet Rose, a Heart Shaped Key Ring and a Love Mug. Flowers Delivery Ratnagiri, Send sweets Phagwara, Wedding Cake Aligarh, Diwali Mithai Moga, Send Flowers and Gifts to Tirunlveli, Online Shop Pollachi, Flower to Pallakad, New Year Flowers Kota , Fresh Fruits Gadag, Send Gift Hapur, Dry Fruits to Kapurthala, Birthday Delivery Navsari, Sending to Latur, Flower shop Ranchi, Kochi Online Cake Delivery.